Arrive Hanoi Airport. After customs and immigration formalities you will be met by our representative and transferred to your hotel. The remainder of the day is free. After breakfast we transfer to Halong bay, 180km north-east of Hanoi. You'll enjoy an overnight boat cruise on Halong bay, which is listed as a World Heritage Area of outstanding natural beauty. The trip of Halong Bay is unforgettable. The boat will stop at Thien Cung cave and Dau Go caves for sightseeing. 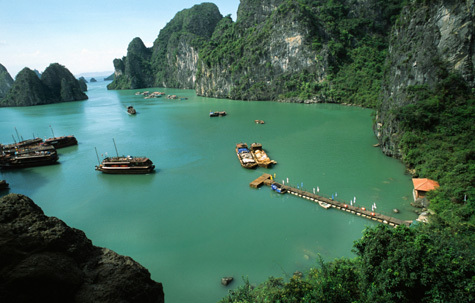 Today you'll continue the boat tour around Halong Bay. In the afternoon it's back to to Hanoi and some free time downtown for shopping. Later in the afternoon you'll transfer to the train station for the overnight sleeper train to Hue. After arriving in Hue, you'll be picked up from the station and transferred to your hotel. After settling in you have a city tour which includes the mausoleum of Minh Mang, the former emperor, which has a tranquil setting in gardens and lakes. In the afternoon you'll visit the elaborate mausoleums of Emperors Tu Duc and Khai Dinh and the Imperial Citadel from where the Nguyen Dynasty ruled from 1802 until 1945. This morning your tour begins with a boat trip on the Perfume River to visit the Thien Mu Pagoda. After the tour you'll drive to Hoi An via Danang. The journey follows a scenic route which climbs over the 'Pass of Ocean Clouds' before dropping down to the photogenic fishing village of Lang Co. After arriving in Hoi An this afternoon you'll checkin to your hotel and have some free time. Known as Faifo to early Western traders, Hoi An was one of South East Asia's major international ports and today it still retains that special old-world feel. Enjoy a walking tour through the Old Quarters to see the town's landmarks of Japanese Covered Bridge, ancient Assembly Hall and Phuc Kien Temple. Hoi An is also famous for its large number of tailor shops, so if you want to have a new wardrobe made up, this is the time to do it. Free afternoon in Hoi An. After breakfast you will drive to Danang for a morning flight to Ho Chi Minh City, then transfer to your hotel. In the afternoon you have a city tour which includes The Reunification Palace (former Presidential Palace), Post Office, Notre Dame Cathedral, Lam Son Square, Ben Thanh Market, Thien Hau pagoda, The Museum of HCM. The evening is free. This morning you have an enjoyable drive through typical Vietnamese countryside to Tay Ninh Province. which is located in the west of Vietnam. Whilst in Tay Ninh you will visit the incredible Cao Dai Temple before continuing to the famous Cu Chi Tunnels. The Chu Chi Tunnels are an underground tunnel network constructed by Vietnamese resistance fighters during the long struggle for independence. Later in the afternoon you'll return to Ho Chi Minh City. Today you will have a very relaxing day sailing along the Mekong onboard the Le Jarai, a converted rice barge. You'll sail through broad waterways and small creeks of the Mekong and enjoy an expertly prepared three course lunch. Along the way you will see traditional rural life including a local village, communal temple and traditional matt weaving at a local farmer’s house. Transfer to Can Tho to spend the night. This morning you have a boat trip to visit Cai Rang floating market where you'll see the thousands of small boats jostling for positions as their owners try to sell their goods. You'll also visit the Binh Thuy old house and market. After lunch, visit Xu Lady and Thoai Ngoc Hau Temple. If time permits you may also visit Sam Mountain. Depart for the 4 ½ hour journey up the river to Phnom Penh. In the afternoon, you will visit the Royal Place, Silver Pagoda, Toul Sleng and the Central Market. Transfer to the airport for your flight to Siem Reap and transfer to hotel. In the late afternoon watch the sunset from one of the most amazing vantage points. Full day visit to the ancient royal capital of Angkor Thom: Bayon, Thommanon, Chau Say Tevoda, Terrace of Elephants and Leper king and Ta Prohm temple. Lunch. Afternoon visit to the 7th World Heritage wonder of Angkor Wat, Ta Som, Ta Keo. Final night in Siem Reap. This morning you will visit Angkor's oldest temple, Banteay Srei. This temple has the most interesting engravings among all the ruins. Later in the day you will be transferred to the airport for departure.